Would you like to remodel the contours of your sloppy backyard and create more space for a patio and lawn? You need a retaining wall. These landscape structures not only conserve your soil but also contribute to your property’s curb appeal. We install and repair concrete retaining walls in Folsom and nearby places. How can we help you? Call 916-571-0908 now. Retaining walls made of interlocked concrete blocks do not need mortar. Their designs vary greatly and only professionals can build long-lasting structures. They hold soil at one edge while standing free on the other side. If your garden has an uneven topography, these walls will be of great help. Our contractors are experienced in all sorts of designs to ensure that your garden attains a level lawn or patio. Take advantage of our expertise if you want to create a living space above the prevailing ground. We can also help you elevate a crop garden and improve its drainage and design a beautiful seat wall right there. These heavy barriers present a lot of benefits if constructed with a high level of workmanship, which is what we present to you. The most challenging aspect of a retaining wall is its strength which enables it to withstand lateral earth pressure as well as the hydrostatic pressure created by the water behind it. Walls which are poorly constructed fail due to the hydrostatic pressure. We assure clients designs with sufficient drainage systems and waterproofing that survive multiple years. There are two classes of retaining walls: walls less than 4Ft tall and over 4Ft tall. Under-4Ft retaining walls are easier to construct but the second design requires greater footing to cope with the high lateral earth pressure. The contractor specifies the footing’s size and the type of reinforcement that is needed which is normally steel. Because of the high risk involved in retaining walls, a permit is needed before construction. Failure of a retaining wall can create great loss on property as well as people living around. This liability is high in areas with unstable slopes and adverse weather like heavy downpour. Heavy rainfall causes saturation of the soil which may lead to mudslides. In earthquake-prone regions, retaining walls are supposed to have unique reinforcement that to mitigate the risk. Short timber walls: these are simple and affordable options. They help in the control of moderate runoff and erosion. Concrete Blocks: They are the most popular and appealing designs. They don’t need large surface area for optimal strength because the materials are already strong. Dry Stone Walls: They are the oldest designs that have been used since the colonial era. They are very functional and strong even today. Veneer Wall: This is a high-end design for landscaping. It has a practical concrete masonry unit core which provides a multitude of design ideas for outdoor spaces. Retaining walls may look attractive but what matters the most is their power and functionality. If constructed with the right materials and proper techniques, they become the long-lasting investments for beauty and integrity. They hold back hillsides and create living spaces from steep slopes. Once in a while, retaining walls crack, lean, or bulge. This is due to poor drainage and installation techniques. Small walls are the most vulnerable and if you need a stronger design, request for a wall that is 8ft tall. Given the many forces that the wall faces, the height should never go below 4 ft. For taller walls, we do step-terracing with double walls. Our engineers have to inspect the site first to see what it can accommodate. 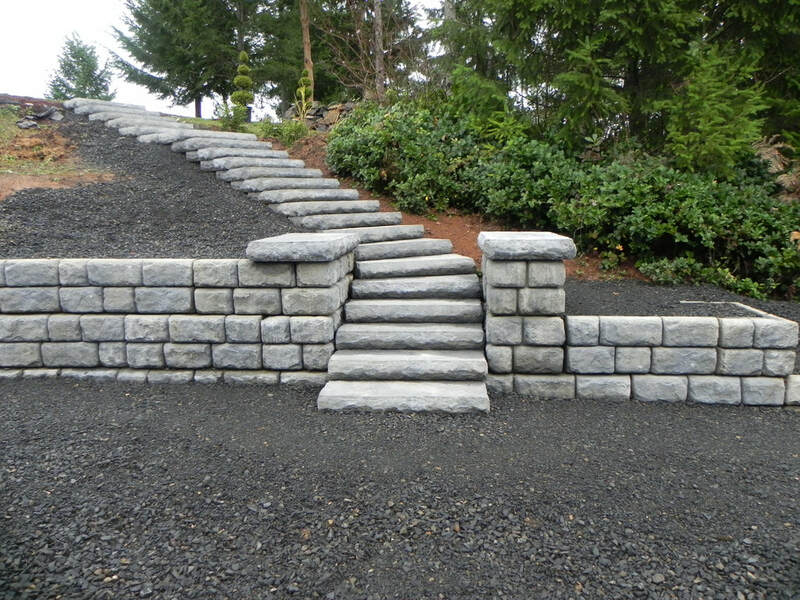 Hire our experienced builders today for exceptional retaining wall installation. Retaining walls may seem like simple blocks, stones, or timbers stacked together. Truth is that they are meticulously engineered structures that stand against the forces of gravity. They hold up saturated soil which can slide and spoil the foundation or wreck the surrounding environment. The barriers form spectacular spots for relaxing as well as viable gardening spaces through terracing of slopes. If you ever need a retaining wall or repair for the existing one, feel free to contact us at916-571-0908. From bricks, interlocking blocks, concrete, and stacked stones, choose the design that meets your specific needs.